The car park is open 6am - 3am, 7 days a week. Please note there is a vehicle height restriction of 2.1m. Sign up for a free Smart Parking account and save 25% a day* and enjoy ticketless parking at Westfield London Shepherd's Bush. 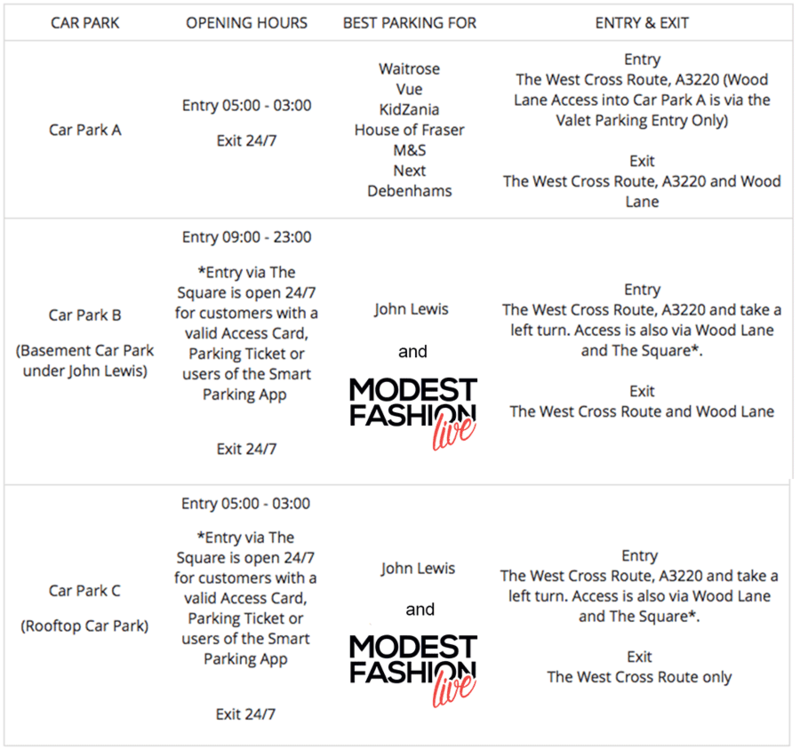 Use postcode W12 7SL to be directed to all Car Parks. You may leave your vehicle for up to 72 hours. For stays of more than 24 hours, you pay the full day rate, and charges restart for the new day. For stays of more than 72 hours, please email help@westfield.com to confirm the dates of your stay and the aisle you are parked within. Four Underground stations provide easy access to the centre, a few minutes walk away. Check www.tfl.gov.uk before you leave for up to date travel information. The Shepherd’s Bush National Rail station has direct connections to Willesden Junction, Kensington Olympia, West Brompton and Clapham Junction. Services run every 15 minutes in each direction Monday to Saturday, with 1-2 trains each hour on Sundays. Your Uber partner-driver will arrive and depart outside Lift Lobby 2 in Car Park A (Level -2). When you're ready to head home, request a ride through the app and meet your partner-driver there. If requesting UberLUX, please wait in the Valet Parking area on the same level. Find the Lounge in Lift Lobby 2 on Car Park Level -2. We recommend booking in advance to avoid any delays to your journey; alternatively our Guest Services team will be happy to assist you.